In a historical move that shocked global markets, Britain has voted to leave the European Union, with almost 52% of voters opting to Leave. 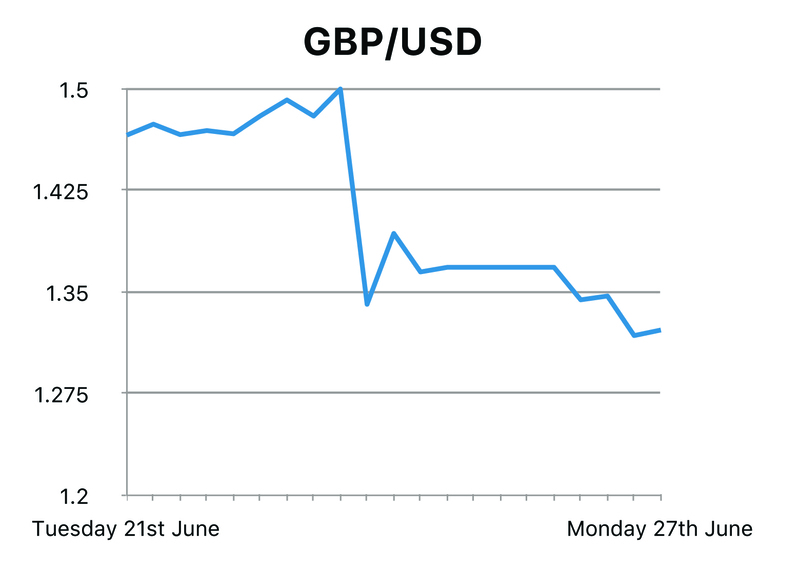 The British Pound hit lows to the US Dollar not seen since 1985, after hitting fresh 2016 highs yesterday. The fall was even larger than during the global financial crisis, when the currency was moving two or three cents in the blink of an eye. Global markets felt the pain as Britain’s vote on European Union membership affected every asset class. The victory for the "Leave" campaign will fan speculation that more countries could withdraw from the EU. Central banks are standing ready to intervene as reaction in financial markets proves reminiscent of late 2008, at the height of the global financial crisis. Moments ago David Cameron announced that he will be stepping down in October, as he believes that a new leader is needed to navigate the UK through the Brexit. After the UK historically voted to leave Eurozone on Friday the British public and wider economy face further uncertainty as both Major parties plunge into leadership turmoil. Both the Tories and labour are in open conflict on Sunday after a vote to leave the EU triggered an attempted "coup" in the main opposition Labour Party and a bitter leadership contest in the ruling Conservatives. Prime Minister David Cameron has said he will resign prompting a fierce battle to replace him and several Labour lawmakers quit the party's top policy team to try to force their leader, Jeremy Corbyn, from office. Former London mayor Boris Johnson, whose support for the leave camp galvanized the "Out" campaign, is favourite to replace Cameron but media have reported that there is a group of pro-Cameron lawmakers looking for "anyone but Boris". Meanwhile Scotland's parliament would consider blocking legislation on Britain's exit from the European Union if that were necessary to protect Scottish interests, First Minister Nicola Sturgeon said on Sunday. Scotland, voted to stay in the EU by 62 to 38 percent in a referendum on Thursday, putting it at odds with the United Kingdom as a whole, Sturgeon, leader of a party that wants Scotland to become independent of the UK while remaining in the EU, has repeatedly said since the referendum result was announced on Friday that she would take whatever steps were necessary to ensure that Scotland's democratic will was respected. Earlier on Friday, Bank of England governor Mark Carney sought to calm financial market fears about the impact of the UK’s Brexit vote by insisting that they will take any measures needed to secure economic and financial stability. Many analysts believe the Bank to boost the economy by cutting interest rates or embark on a further programme of quantitative easing, but Carney made it clear that the BoE would not be rushed into decisions by the shock nature of the referendum result. Mario Draghi spoke at the Committee on Economic and monetary Affairs at the European Parliament. Draghi stated that “the recovery of the Euro area economy gained momentum at the start of the year” and “it is expected to proceed at a moderate but steady pace.” He also suggested that “further monetary policy stimulus is in the pipeline”. Current measures Draghi argues, “been instrumental in putting the recovery on a more solid footing and thereby securing the conditions for inflation to rise towards levels closer to 2% over a not-too-distant horizon”. Going forward, the message was that “efforts should now concentrate on strong policy action to improve the business environment, favour investment and raise productivity”. European Central Bank (ECB) President Mario Draghi did not overly encourage investors with his latest pledge to support growth in the Eurozone, particularly as he reiterated the need for fiscal reform to complement monetary stimulus measures. German Consumer Confidence figure for June was also released yesterday coming in lower than markets anticipated at -7.3 however markets movement were minimal. 10 year German Government Bonds hit new record lows as financial markets worried about what Brexit will mean for Europe’s stability. 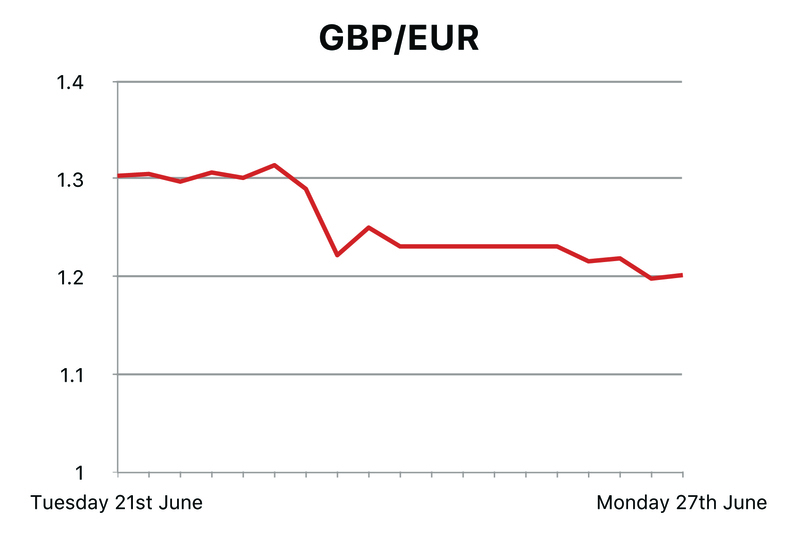 As the Pound plunged to record lows, the euro slid by the most since it was introduced in 1999. 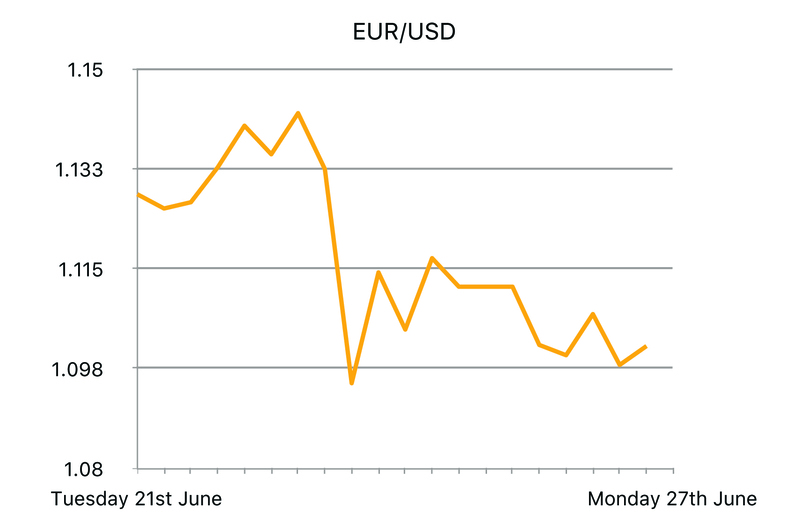 The euro slumped 3.2 percent, while currencies in Norway, Sweden and Turkey posted even steeper losses. Japan’s currency, seen as a safe haven, jumped by the most against the dollar since 1998. Europe’s leaders are divided over how to negotiate Brexit and Britain apparently reluctant to initiate formal talks on leaving. European countries are pushing for a rapid exit. The foreign ministers of the EU’s six founding members want Britain to start proceedings “as soon as possible” to avoid a long and potentially damaging period of uncertainty for the already weakened bloc.